Maria's Mélange: What has she got in her purseses? What has she got in her purseses? 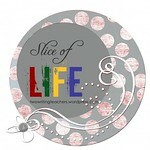 I’m attempting to write every day in March as part of the Slice of Life challenge hosted by Two Writing Teachers. Come on by! First of all, bonus points to you if you get the reference in my title! My husband and I are both geeks, and we toss around Hobbit quotes willy nilly in our household. Yes, we glance at one another, adopt our nuttiest Gollum voice and murmur, “What has he got in his pocketses?” We frequently burst out with a refrain of “down, down, to goblin town” or warble on about “fifteen birds, in five oak trees”. If you’ve seen the incredibly campy 70s animated Hobbit, you can appreciate this. I’m going to toss out the gauntlet here. Take a moment and dump out the bag you carry around with you most often. You know; the one that accompanies you to the grocery store. The one that receives all the little tidbits handed to you by your children. 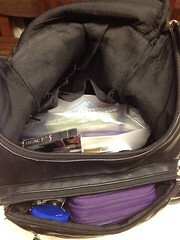 I’m guessing I’m not the only one who carries a “mom bag” and rarely cleans it out, right? Go ahead, take a moment and dump that puppy out on the table. I’ll wait. Are you done? Great! Let’s see how we compare. Ready? 8 receipts from a variety of stores including Target, Michaels, and Sports Authority. 1 single button from an unknown shirt. 4 tickets to a museum in Cincinnati, OH – from July. 6 AA batteries. I’m pretty sure I took them to my nephew’s birthday, just in case his toy needed them. 5 pens – at least one of which has been out of ink for a year, but I keep forgetting to throw away. 1 key card to the conference I attended this past summer. No, I can’t use it again this year. 1 whistle – you know, the kind your gym teacher uses. What the heck? Okay, this is just getting embarrassing. The worst part is that this is only from the front pocket of my purse! I better call this quits before I reveal any deep, dark secrets. Don’t tell Sir Gawain, but I think the Holy Grail might be in the main compartment! Take a moment and prove I’m not completely nuts. What’s the strangest thing in YOUR bag?